There are so many ways now to send messages to people that you should never be stuck for how to get yours across. If you want to send a message to somebody who you know only through work, maybe a colleague, associate or client, striking the right balance can be tough. Emails are too impersonal, you may not know them well enough to utter those words, and a hand written note is, well, boring. If there is someone in your business environment you want to send a message to telling them to be brave these Courage corporate ecards is the answer to your prayers. Two hands coloured into a map of the globe are held together palms up. 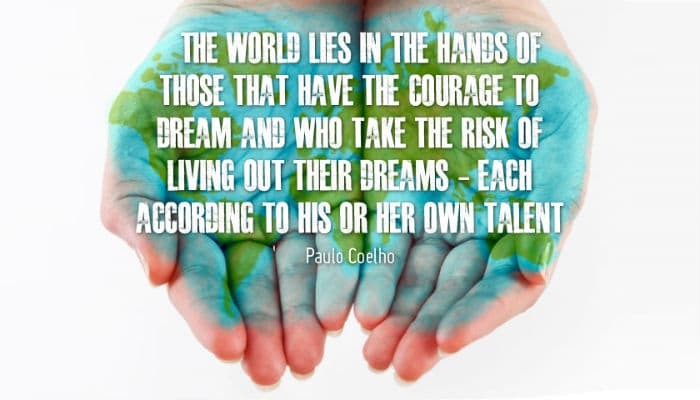 The words across those hands read “The world lies in the hands of those who have the courage to dream and who take the risk of living out their dreams – each according to his or her own talent”. We all have our own special talents and we owe it to ourselves to make the most of them. Sometimes people just need to know that others believe in them to do just that and these ecards, along with a personal message, will let them know that you are one of the believers. While you are with us today why don’t you have a play with our Christmas ecards for business and see how your Christmas holiday messages can be so powerful with Ecard Shack.